Catheters enable surgical procedures to be performed in hollow vessels or organs in order to investigate them, inject fluids or drain the said cavity. For this kind of thorough operation, the manufacturers of catheters must insure the fineness and flexibility of their product, as well as, control the exerted torque at the end of the catheter. The angle of the catheter handle, directly impacts the exerted torque. Excessive torque can lead to a risk of deterioration of the vessels (among many other things), and not enough torque may lead to bad implantation of the prosthesis. Therefore, it is essential to master the torque in accordance with the angle. 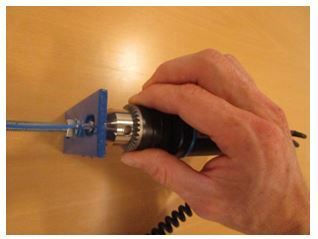 By combining a torque device equipped with a chuck, and an angle measuring system (such as a protractor for instance) it is possible to control the exerted torque of a catheter to a given angle. This control can be done during the research and development phase or for quality inspection. It enables you to insure the linearity of the torque/angle ratio and thus optimizing the quality of catheters. Our torque instruments Centor Easy TH and Centor Star Touch TH have been chosen for this type of test. - Rotate the handle in a clockwise or counterclockwise direction and read off the measurement at each, predetermined interval (90°, 180° and 360° for example). The display will plot the maximum and current value, in real time. - Once the test is finished, loosen the TH-chuck and remove the catheter. Our TH sensor is tailored for torque measurements on catheters. The instant and/or maximum torque value is displayed on screen - with the curve of the corresponding values displayed using the Centor Star Touch. The results can then be saved in the internal memory of the torque gauge or shown on a computer via our RSIC Lab and Caligraph software. The data can also be saved on a USB stick to be seen and processed after your tests with the Datastick II software. The TH is user friendly and our sensors offer great precision (0.5% of the full sensor scale), making it a precise and affordable solution for your tests. The Dual version of the Centor Touch can also be equipped with a angle sensor which replaces the protractor. The display performs the data acquisition in real time with the torque and angle values at a resolution of 0.1°. This torque/angle data can also be plotted live through our Caligraph software and stored for thorough analysis.